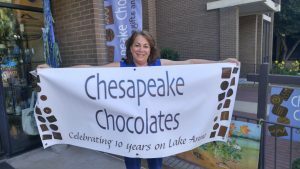 Chesapeake Chocolates, Wine, Gifts and More will celebrate 10 years on Lake Anne Plaza on Saturday, July 8th, with a full day of free special activities and tasty treats! 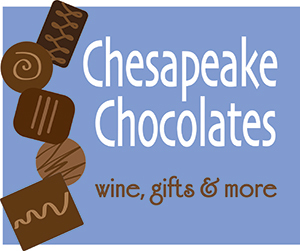 In conjunction with the debut of the Lake Anne Roots Music Festival, we will feature chocolate dipping, a wine tasting and the introduction of our new Lake Anne chocolate bars in milk and bittersweet chocolate. Join us at 11 am to dip your own chocolates and stop by all day to enjoy free samples and 10% off any chocolate purchase. 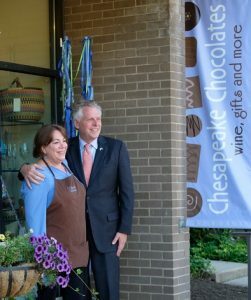 From 2-4 pm we will hosting a free wine tasting that will feature 2 recent Virginia Governor’s Cup gold medal winners as well as a new wine especially selected for the summer season. Mark your calendars, we look forward to seeing you! !